My Definition of Then and Again Photography in Colorado. I was inspired , wow must have been over 10 years ago, by a presentation I attended by John Fielder who was introducing/trying to sell his newest book ” Colorado 1870-2000″ . 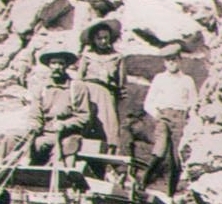 He reproduced many of William Henry Jackson’s Colorado photos and made a huge coffee top book out of them. I was admittedly intrigued by this idea of reproducing photos taken many years ago. To witness the change over time is really a great experience and the adventure of the search for the reverse view in the photo so as to reposition yourself as close as possible to the original location of the shot, kind of makes this lesson in photography a sport! So I was searching for some related links such as one about Fielder’s book and a couple of interesting things popped up. From one interesting comment I have stolen this: “As a Colorado history buff, I’m a little annoyed at all the hype the media has given the Fielder-Jackson project. The fact of the matter is Fielder’s project is in no way original or ground-breaking. Several other photographers have quietly done similar projects over the years. The first that I know of to publish a then-and-now book on Colorado was Robert L. Brown, who published a series of such books in the 1960s. The first person to start work on a then-and-now book in modern times was Grant Collier, who re-shot the images of his great-great grandfather, Joseph Collier in the book Colorado Yesterday and Today. ” So I tried to chase down some of those links that turned out to be rather interesting. I also came across this page presented by the Aspen Historical Society called Then & Now that features many of Jackson’s and Fielder’s Photos that I really enjoyed! Where to search out Historic Photos of Colorado. Warning, if you are a history buff you can literally get lost for hours on these pages! So these are just a few sites that I frequent. You can usually download a low quality version of these photos as a reference, then purchase any keepers at a low price! The ultimate page for searching in my opinion is the Denver Public Library Digital Collection But I have also become attached to the Collection at Fort Lewis Collage in Durango Colorado. One of my favorite local Colorado Photography collections from the Walker Art Studio, once located in lil ole’ Montrose, Colorado is now located on their page and many others. ——-Wow I had to catch myself as I almost slipped off into a 4 hour photo exploration on this page! I warned you! So how to get started in the sport of Then and Again Photography in Colorado. So this is what I do, I am not sure this sport has any real rules yet so play it as you will! 1-Find a photo that you would like to reproduce and print yourself off a copy of it. 2- Now the fun begins! Grab your photo and search out the general location it was taken and travel to that spot, as you get closer the shot location and angle should start to become apparent though finding that exact spot can prove to be challenging. 3- When you think you are there what I tend to do is hold the printed photo up in my left hand and my Digital Camera in my right with the LED screen on while looking off in the direction of the photo and see how they look. I am sure real photographers will some how figure out the exact type of lens etc, and if you are that into it, please pursue this all you can. 4- If this looks like the spot, frame and take the photo, I then usually document the GPS coordinates, just for the heck of it. Many new digital cameras will do this for you, like that if you may! 5- I then get home and use a Digital Image Manipulation program and crop, etc. 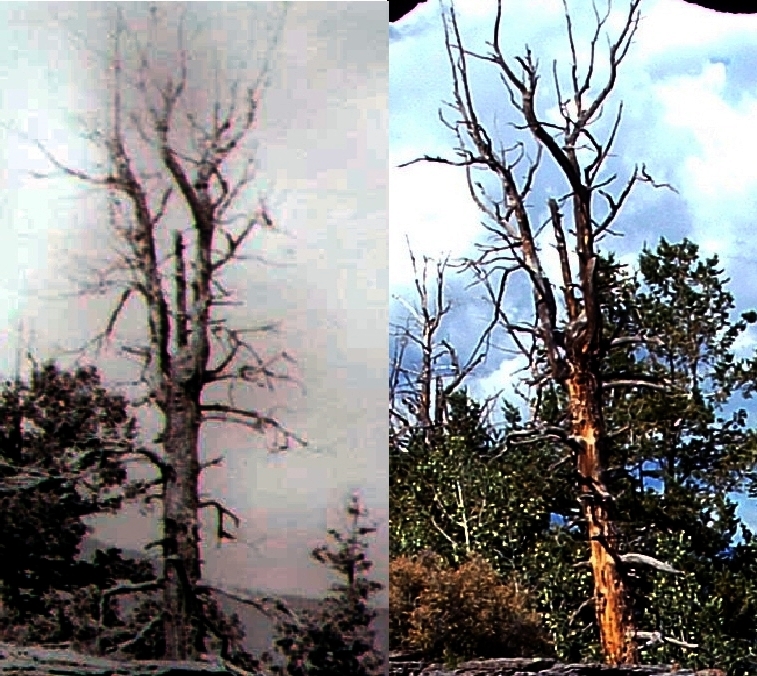 to see how close you can get to the original historic Colorado photo and there you go. 6- Now the most important thing is to share them with me, I would love to see your work! You can comment on here with links to your photos or if you are a Facebook-er you can post them up on our Facebook Page, along with a story about your adventure, links to your web page if you have one, etc. and I will create a Then and Now Photography page to showcase your work!! So time to get started in your then and now Colorado Photography Adventure. Like I was saying, once you get involved with then and again photography you will find it is really like a sport. Sometimes a bit athletic, depending on how ambitions the old school guys were, but keep in mind the amount of equipment they had to pack around. Boy we have it easy. Though I talk about Then and Again Colorado Photography, I love them all no matter where they are located so please share them all, thanks! But until I get some examples of you all’s Then and Again Colorado Photographs I will start a series of posts of some of my better examples soon. The example on the top of this page was one I had actually did not take, because I wanted to be in this particular Then and Again Colorado Photography shot, but that is one of my favorites taken at the Social Tunnel above Telluride, Colorado on Imogene Pass/The Tomboy Road! 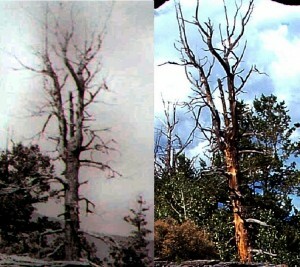 Check out this dead tree from that Then and Again Colorado Photograph! So who wants to give it a try? please share what you do on Alpine Paradises Facebook Page! ← The Off-Road Highway to Heaven, Kendall Mt, Silverton Colo!